This wedding cake, is seven heart shape cakes. I used the Wilton heart shape set. 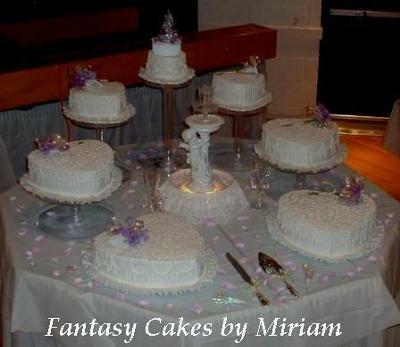 Each cake of a different flavor and filling. It is iced in Italian Buttercream with Cornelli Lace design on top which is achieved by using light consistency buttercream and slowly moving the icing bag in different directions while pressing the icing out. A cherub fountain compliments this cake's decoration. There are different type of seven heart cakes and have different flavor and filling. Once I need this type cake on the wedding occasion then I purchase seven shape cakes for all the guest. You’re blog is appreciate and help for purchasing this type of cakes. If you are searching any kind of writing services and here you are right place and you can meet with our professional dissertation writers for your academic writing. You did a FANTASTIC job ! It turned out just BEAUTIFUL....... So was your presentation ..